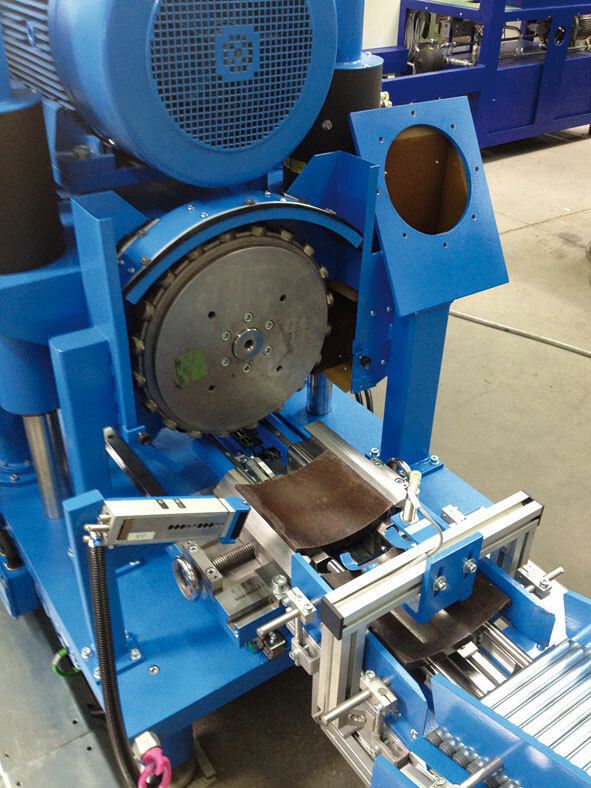 ERLMANN IRG-D is designed for the grinding of heavy duty drum break blocks after pressing and hardening process according to OEM-specification. Grinding of up to 600 blocks per hour can be achieved. The grinding wheel is mounted with 15 to 20 diamond coated grinding bodies, which are adjustable in high about 0,5 mm. These parts are easy to change. For each inside radius a corresponding basic grinding wheel is necessary. The grinding bodies are usable for the different basic units. The location of the grinding motor is adjustable in high, for the different radius. The block is fixed in a grinding adapter, which is adjustable for given specification. 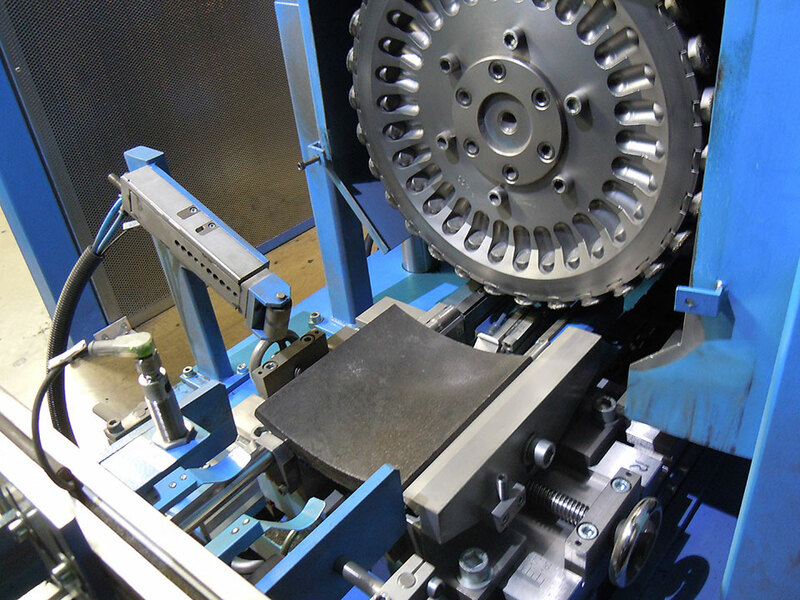 After the loading the blocks will be fixed for grinding operation in a grinding adapter and led vertically to reference side under the diamond grinding wheel. The diamond grinding wheel decreases correspondingly adjusted grinding excess and so produces the required surface of inside Radius. After the grinding the finished machined block is removed by a pulling device from grinding adapter and put it to unloading direction. 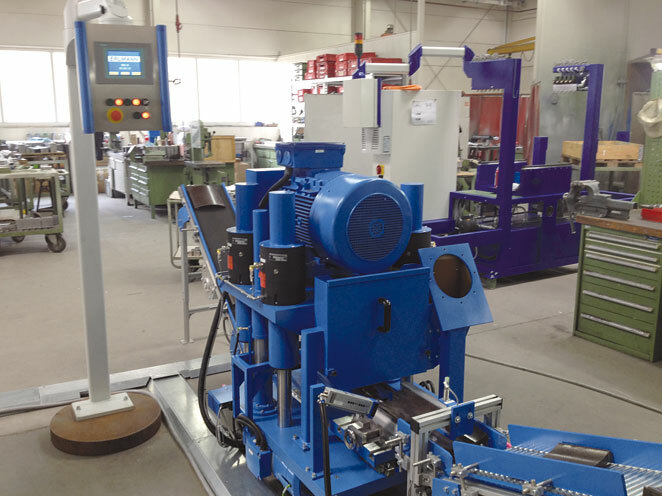 The automatic block-loading, -positioning and -fixation is completed pneumatically. The grinding adapter of the feed pickup operates hydraulically. The drive of the diamond grinding wheel is powered by a three-phase motor. When the machine stops diamond grinding wheel is braked electrically. The machine is equipped with a SIEMENS PLC to control workflow and a SEW-master-slave system for the spindle adjustment. The location of the grinding centre will be displayed on a SIEMENS multi panel. Loading and unloading of blocks can be done by a conveyor automatically. 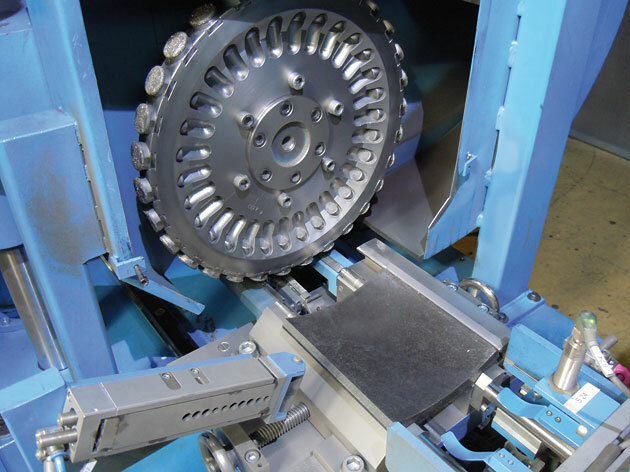 The machine can be connected with a loading magazine and with a following CNC-ORG. The machine is supplied with a full set of dust guards and extraction nozzles, ready for connection to customers centralized dust extraction system. The complete machine is enclosed for dust and noise protection.